“Automation test” explains about the easiest way to do test work and reducing human work, increasing coverage of Testing and re-usability. A million dollar question arises I.e. “how am I going to start coding?”. Basically, coding is the pillar to make stand automation test to prove the ultimate way to make Testing easier. Now the main question is “How the professional can write a code or script for Automating the application/module? The answer is the outstanding tool/framework known as Robot Framework (RF). The Robot Framework is a test automation framework which is generic in nature, used for acceptance testing and acceptance test-driven development (ATDD). It is a keyword-driven testing framework that uses Tabular test data syntax. Robot Framework is very easy to use a tool. Easy to install and is platform independent. Robot framework (RF) makes it is easy for a professional with a less knowledge of automation; to start developing automated test cases. The use of the Selenium2 library in RF will help a person to automate the existing manual test cases of any project in a Rapid Phase manner. And the best part is its outstanding Reporting System. The RF automatically generates the reports after executing each build. All the features below ensures that the Robot Framework can be used to automate test cases in a quick and proficient manner. Moving on to the test cases, Robot Framework has all its test cases in Tables. You can save them either in HTML or table-separated value (TSV) files. There are several ways in which you can organize test cases in Robot Framework. Test cases are made into test suites taken either from single or multiple files. The simplest example of a test suite is a single HTML file containing multiple test cases. Another key feature of Robot is the Test case Tagging. Each tag (e.g. critical, quick) assigns test cases to a separate set. When executing, you can run the tests based on Tags like “Critical” and “Quick”. Once the Test cases design is finished, those test cases can be executed using Python scripts. Since our robust Robot Framework is System and Platform independent – we can run our test cases on any platform like Windows, Linux, Unix or Mac using Python. Generating report and log in HTML format. The tester can set numerous options from the command line: select the test cases by name or tag, Set variables, Configure the order in which those tests will be performed. The last option is really useful. You can run tests randomly, thus increasing the probability of finding bugs. Figure-2 below is one the reporting style of Robot Framework. When the user executes the Robot Script, it automatically generates the Report of execution. 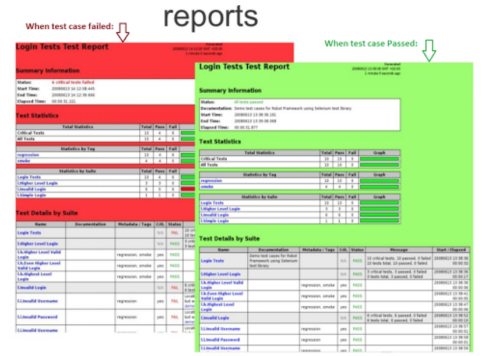 This report is the plain HTML/XML format report which is very easy to understand. The second interface, supported by Robot Framework is the web using real browsers. 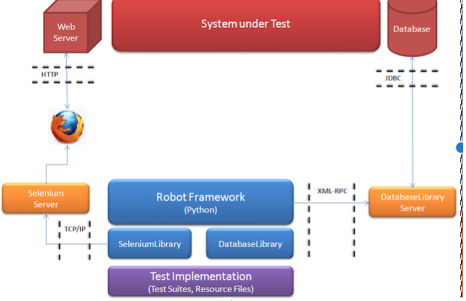 We have a Robot Selenium library to work with Selenium web testing system. The Robot Selenium library already includes keywords to open a web page in the browser window, input some text, click ant button, submit etc. So, it makes your automated testing of web applications much easier. The third interface we can test with Robot Framework is GUI. Currently, the Swing GUI library exists. It provides keywords such as Pushbutton, Menu items such as Start application, Close window, pretty simple and self-explanatory etc. Robot Framework allows testing more than just the web-application needs (Selenium Web driver covers only Web application testing). Robot Framework provides lots of libraries to test different application like Appium, Database, Android Library etc. Robot Framework is very easy to use, and overall its application/platform independent. Robot Framework is easy-to-use, yet robust/powerful enough to be an acceptance-level test automation framework. It is flexible and the user can extend its functionality through Python and Java modules. The user doesn’t need much programming knowledge and experience to write test cases. Writing them in tables makes the user’s test well -structured and ultra-readable. The logs and reports are also a good information resource. Hands down Robot Framework is our go-to web automation tool.